Colours are fascinating. They are part of natural light. They have properties that work with our entire being. They have an impact on our mind and emotions and have been used for thousands of years to restore balance in the human body. Egyptians used coloured windows to create halls with different frequency of light, so colours could be applied therapeutically by priests. In the 17th century Isaac Newton discovered that prisms can disassemble and reassemble White light. He divided the spectrum into seven different colours, the colours of the rainbow: Red, Orange, Yellow, Green, Blue, Indigo, and Violet. However later on it has been proven that the frequency of Indigo for some people is difficult to distinguish from Blue and Violet. According to later discoveries comparing Newton’s observation of prismatic colours to a colour image of the visible light spectrum shows that “Indigo” corresponds to what is today called Blue, whereas “Blue” corresponds to Cyan. In the early 19th century, the concept of the visible spectrum became more definite, as light outside the visible range was discovered, such as infrared and ultraviolet. 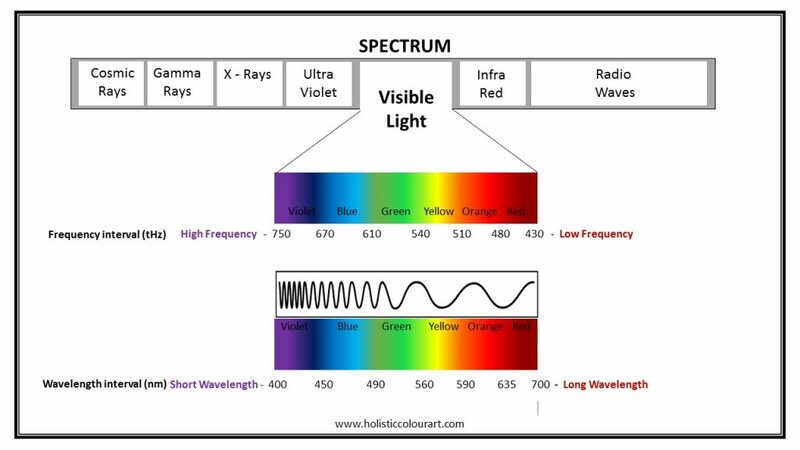 The visible spectrum is the part of the electromagnetic spectrum that is visible to the human eye.When we look at the representation of the visible spectrum it’s impossible to identify all the colours the human eyes and brain can “see”. There are colours, which are only made of one wavelength, they are called spectral colours. And there are others, like Pink, Purple and Magenta which can only be made by a mix of multiple wavelengths. These colours are called unsaturated. “The human eye can distinguish something on the order of 7 to 10 million colours.” How is that possible? Colours are partially determined by frequency, but the other part is down to our brain i.e. how it interprets the mix of different frequencies reaching the eye. There are no two people who can see colours the same way. What is sure though to be healthy we need all the colours of the rainbow and their variations. The human energy field / eletcro-magnetic field acts like a prism, breaking down the light into colours resonating on different frequencies, corresponding with our 7 main energy centres or chakras. 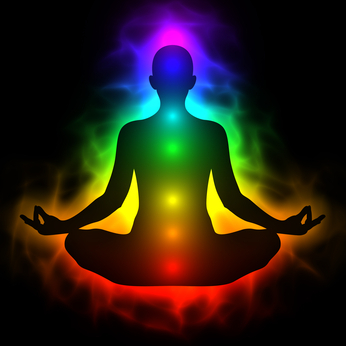 Our chakras are connected to different organs and systems in our body, nourishing our being. Therefore we can’t live a happy and healthy life without natural light. Unfortunately in our sped up, frantic life lots of us are loosing connection with nature. Many people spend the majority of their week in offices without or with very little daylight, then sit in the car or travel by public transport arriving home between walls again. Although natural light can’t be substituted from the health perspective, you can make your space more healthy by introducing the right colours as wall colours, soft furnishing, smaller or larger part of decor. 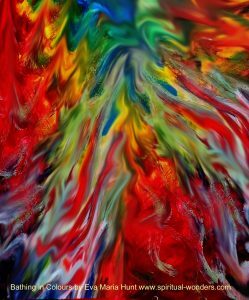 Here is one of my abstract paintings, Bathing in colours that certainly will liven up any space. Have a look at my artworks in different settings.